(TibetanReview.net, Jul27, 2016) – A Tibetan Buddhist monk who remained disappeared after he was taken away by Chinese police from his monastery in Ngaba (Chinese: Aba) County of Sichuan Province in Nov 2015 has finally be located by his family and relatives in a prison in a neighbouring county, reported the Tibetan service of Radio Free Asia (Washington) Jul 25. 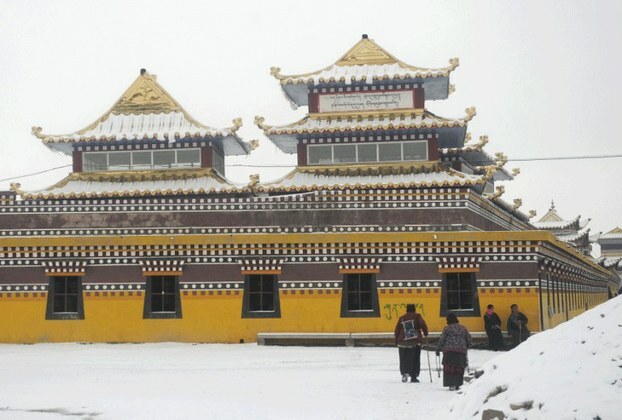 The monk, named as Lodoe, was taken away by Chinese police from Kirti Monastery on Nov 18 without stating any reason. There was no intimation or announcement of the charges against the monk whose relatives kept searching for him in the following months. They finally located him, by their own efforts, in a prison in neighbouring Lunggu (Wenchuan) County. It still remains unclear, however, what the monk has been accused of or convicted for and what his jail sentence is. It is believed, however, that he was jailed because he had formed a WeChat group in connection with celebrations marking the 80th birthday of Tibet’s exiled spiritual leader, the Dalai Lama, last year. Earlier, in Oct 2011, Lodoe was arrested for making a Tibetan national flag and jailed for three years, the report added.